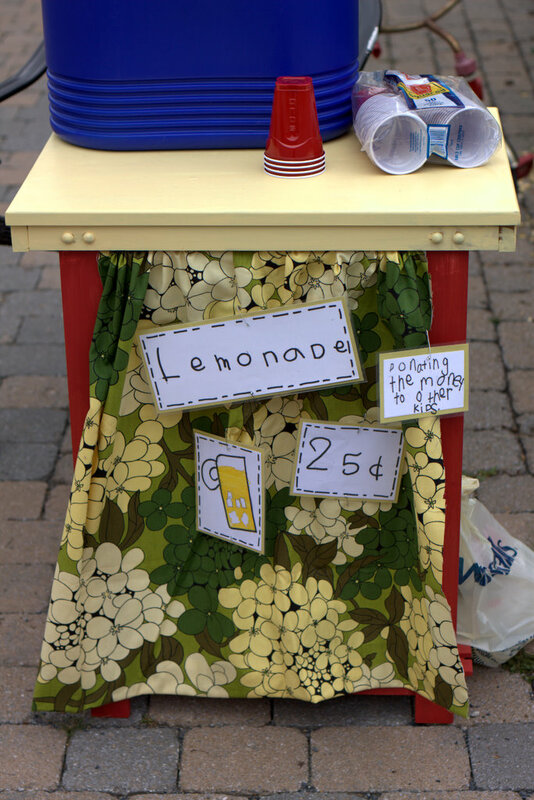 I remember reading somewhere that you should ALWAYS stop and buy lemonade from a kid; I wholeheartedly agree. E had the idea a couple weeks ago to build a lemonade stand (I think he was inspired by an episode of Curious George). We had this unused cart in the basement and converted it into E's stand. He chose the colors and fabric and made all the signs himself. We didn't have to buy anything; we used whatever we had in my stash from previous projects. oooh...I lied, we actually had to buy a small rod to hang the curtain. It's often hard for E to complete a project from start to finish, but he did it and he is proud. Today he set up his stand at his Memere and Pepere's house. I was nervous about him not having customers and tried to prepare him ahead of time to ease the disappointment...no need! Within minutes of setting up, he earned his first $1.00. The smile on his face was priceless! ...IT'S A QUARTER, PEOPLE! Even if you don't like the lemonade, you could make a kid's day with 25 cents! And really, it's not about the money to the kid. E really was just excited that someone stopped for HIS lemonade. On a side note, Little Miss manned the stand while her brother made a bathroom run. Thank you to the four customers (that are not relatives) who did stop and buy lemonade. You made E's day. He told his dad tonight, "Business was pretty good today, Dad." So, I ask, will you stop next time you see a kid selling lemonade? It's an easy way to make someone smile! Thank you SO SO SO SO much for your scrapbooking suggestion. I had NO idea I could create 12 x 12's in Picasa...and I'm the Picasa queen! I am sure I am going to go that way...I can add little things later once I get the pages printed. I am so excited...I got so many suggestions, but seriously, most of them don't work for me..I really don't have the desire or time to learn an entire new program, nor do I want to do books...I love the "real" scrapbook feel. You are welcome! I'm glad I could help. You are the person who taught me how to do a blog banner in Picasa. If you have access to a scanner, you could add different momentos that way as well. I hope you will share some pages; I know I'd love to see them.